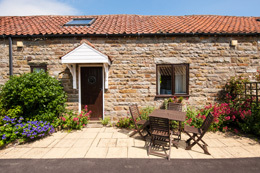 The two bedrooms in this spacious cottage will sleep five and there is also room for a cot. 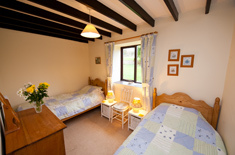 The cottage is spacious with a high pitched beamed ceiling in the lounge. 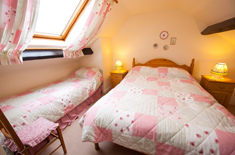 A twin bedroom is also downstairs, next to the shower room. The kitchen and dining area is in the lounge. 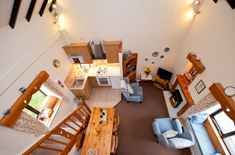 From the lounge, the stairs and gallery lead up to the charming double bedroom that also includes a single bed. A cot & high chair are available at no extra cost. This is an ideal family cottage.